We all know that simple styling of the hair can really change our entire appearance. A good haircut can turn any person gorgeous. This is without a doubt. But there is another part of our bodies that supplements are attributed but is mostly overlooked. Unlike hair which one of the first things people notice about us this other part catches the eye very late. It speaks volume about the nature of the person. This part is our nails. Our nails can speak loud and clear the way we live life. Therefore, it is important to take care of them. 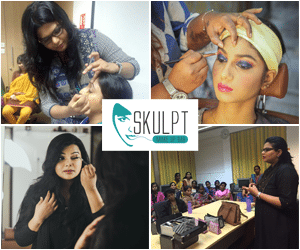 At Skulpt we are not just simple aesthetic beauty place where you can get the best makeup classes in Chennai but also considerate cosmetologists who love to teach you to take better care of your hair and nails. This article will talk about ways to maintain both of them and how to keep them healthy. The best way to keep hair and nails shining is to eat healthy food. When you nourish the body from within the results, show on the outside. A vitamin-rich diet will not only make the hair grow longer and faster but healthier. Another good way to keep the nails and hair strong and less brittle is to use natural health products. These products are made with ingredients found in nature. Thus, they are not only environmental friendly they do not cause harm to nails or hair that chemicals can induce. When it comes to nails the biggest issue, women face is that as they grow longer, they become brittle. This means they break very fast from the slightest of pressure. When you use natural products that not only exfoliate dead cells from the upper layer but also nourish the skin below you reinforce the nails. Fortifying the skin with minerals is vitally needed for healthy nails and hair. Once you have given your nails a good buffing with natural products, use any natural oil like olive to massage them. You will not only have glimmering nails but also the strongest nails you have ever seen. A good manicure is important every few weeks to remove dead skin and cuticles from around the nails and to make them look glamorous. You can either do one at home or go to a salon for it. But when it comes to hair styling and cutting it should always be done by a professional. With hair oiling, shampooing and conditioning are not the only ways to keep it healthy. A good haircut that suits the face cut and complements the best features can really give a healthy look to the hair. Getting it styled can turn washed out or just flat lying hair into the bouncy wavy hair. A trick to keeping hair healthy is to get a trim at least every few weeks and a good haircut every few months depending on how quickly your hair grows. Change your hairstyle. Don’t always keep it the same. Use as less of styling tools as possible as the heat damages them. Washing hair every day is not good. If they are getting too greasy too quickly ease up on the conditioner, you use.